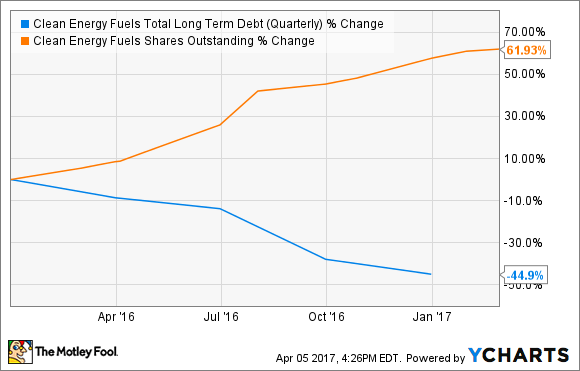 Better Buy: Clean Energy Fuels Corp. vs. Chart Industries, Inc.
Clean Energy and Chart Industries are both heavily tied to natural gas but in different ways. Here's a closer look at which is a better buy right now. Several years back, investors were excited about the potential for natural gas to shake up the transportation industry. Cleaner-burning than gasoline and diesel, not to mention plentiful, many expected it to become the fuel of choice for commercial transportation in North America, and for China to push to accelerate adoption as the country fights to reduce severe air pollution in its metro areas, even as the number of vehicles on the roads continue to climb. Clean Energy Fuels Corp. (NASDAQ:CLNE) and Chart Industries, Inc. (NASDAQ:GTLS) were two of the most touted companies, with the former leading the way as the natural gas provider for transportation users. Unfortunately, the anticipated explosion of adoption hasn't exactly played out as expected. As of this writing, both companies' stocks are down more than 70% from their all-time highs. And while the natural gas transportation revolution hasn't been the huge success investors expected, both Chart and Clean Energy still have solid prospects. But which is a better buy today? Frankly, it boils down to what your expectations are and what you're looking for as an investor. Let's take a closer look at these two companies and what you should consider before you buy either stock. CLNE Total Long-Term Debt (Quarterly) data by YCharts. And even though the company has eroded per-share value to strengthen the balance sheet, the business has continued to improve. 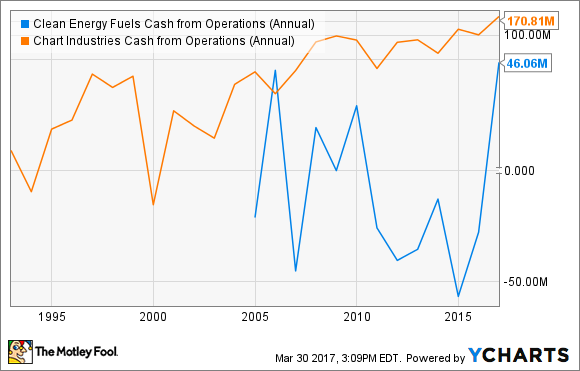 Fuel sales -- the best measure of company growth -- have nearly doubled over the past five years, and management has steadily found ways to lower operating costs. Even with capital spending set to be at a five-year low in 2017, the company has more station projects lined up than in years past, which will drive more fuel volume growth. The potential for natural gas in transportation remains enormous, and maybe no other company is better positioned to profit from even small growth than Clean Energy. At the same time, a recent agreement to sell the company's RNG production facilities to BP raised another $150 million in proceeds, that management will use to pay down even more debt, further lowering recurring expenses. And while the sale of these assets will affect profits, Clean Energy is likely to remain cash flow positive. As part of the deal closing, the company released pro forma operating statement and balance sheet that showed how the asset sale would have affected the business if it took place prior to the start of last year. The bad news from that operating statement was that the company's GAAP net loss would have more than doubled to $27 million. Factor in the expiration of a tax credit that was worth $28 million in cash last year, and there's reason to be concerned about its ability to reach profitability this year. But at the same time, Clean Energy Fuels' interest expense is likely to fall by as much as $20 million from 2016, and if fuel volumes continue to grow at the near-double-digit rates of recent years, it's just as likely that the company will continue to generate positive cash flows. Most importantly, it's likely that the worst of the dilution is over, with its balance sheet and debt profile in solid shape, and this should allow management to start rebuilding per-share value again. And with an addressable market more than 100 times bigger than the company's current base of business, there's a lot of growth potential, but a lot must go right for the potential to be realized. Clean Energy, on the other hand, is a pure play on natural gas vehicles. The company builds and maintains natural gas fuel stations, manufactures and sells equipment for those stations, and sells fuel at those stations. That's it. Chart, on the other hand, is measurably lower risk. It has a more diversified business that has proven resilient to industry downturns and has a much better track record of profitability, while Clean Energy must still prove it can operate without external cash from debt or selling stock.